FortiVoice systems come complete with everything your small office needs to ­handle calls professionally, control communication costs and stay connected everywhere. It’s a compact, easy-to-use system for small, multibranch and home-based companies­with up to 400 phone users per office. Impress your customers with a range of features usually found only in large-scale phone systems. You can answer calls with sophisticated multi-level auto attendants and dial-by-name directories. Or connect to off-site and mobile ­telephones as though they were on-site extensions. FortiVoice allows you to seamlessly pick up calls wherever you are. And more. Most systems make you choose between VoIP and the traditional telephone ­network. FortiVoice offers a true hybrid for small business. Whether you connect to traditional, digital or VoIP lines, the system works the same way. Highly flexible, multi-level auto attendants Never miss a call. Ensure all calls are answered professionally, 24 hours a day, even if everybody is busy, andwithout the cost of dedicated staff to answer the phones. Multiple levels allow customer service in different languages, or different caller options in different departments. Connect anywhere extensions Integrate cell phones, home phones and phones in other locations, so that callers can dial the main office number and connect with any employee, anywhere. Multibranch VoIP networking Optionally use VoIP to connect multiple locations, around the block or across the country with no long-distance charges. Built-in voicemail Save costs on phone company voicemail and consolidate cell phone and desk phone voicemails in one place. Receive voicemails in e-mail for easy retrieval and storage. Ring groups and call queues Line callers up in department-specific hold queues that agents can answer first-come, first-served. 1 Up to 4 FortiVoice units can be networked on a LAN, combining line and extension capacity to these maximums. 2 Analog phones, fax machines and other devices can be used for up to 4 or 8 of the extensions on each unit. 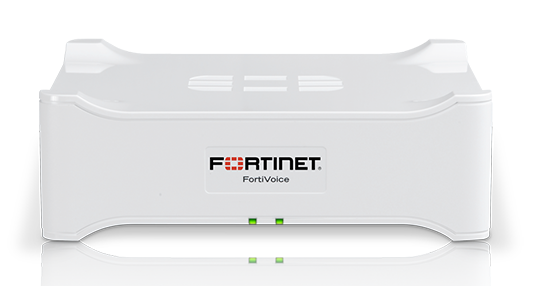 Download the Fortine FortiVoice-100T Data Sheet (PDF). Download the Fortinet Product Matrix Data Sheet (PDF).